PICAXE analog data gathering need not be limited to one quantity, nor the ability to control devices limited to one device. 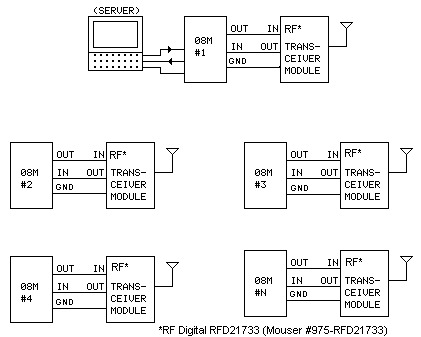 The "qualifier" in the 08M input statement allows multiple chips to be individually addressed, as can multiple I/O lines on individual chips. 08M chips could be daisy-chained with ordinary low-voltage interface wiring, such as the "quad" station wire used to connect (wired) telephones. The low data rates involved should allow distances of hundreds of meters. Likewise, such a data-gathering/control system need not be limited to temperatures. It could easily be adapted to other forms of data - pressures, electrical measurements, positional information, anything that can be represented by an analog voltage. There is almost no limit to the usefulness of this little chip when mated to a server for gathering and presenting analog data and controlling things!